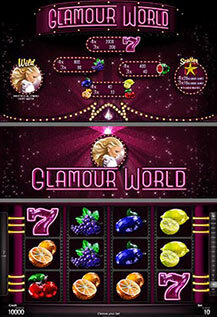 Let yourself enter in the world of Glamour Stars with the 7-line and 4-reel game „Glamour World™“. Glitter and shine by winning sparkling fruit and star symbols. Wild symbol replaces all symbols except Scatter. If one or more Wild symbols appear on the first reel without any win, the first reel is locked for one additional game. 3 or 4 STARS (Scatter symbol) trigger 10 or 20 Glamour games with locked Wild reel. Wild symbol (GLAMOUR GIRL) expands during the Glamour games over the complete first reel and this Wild reel replaces each symbol including Scatter. Glamour games can be won again during the Glamour games.